The Australian Army Nursing Service was one of only two women's services (the other being Voluntary Aid Detachments) that were active at the outbreak of war in 1939. Initially the enlisted World War 2 Nurses were the only females to serve outside Australia. Members served in England, Egypt, Palestine, Libya, Greece, Syria, Ceylon, Malaya, Singapore, Papua New Guinea, Solomon Island as well as throughout Australia. They served on hospital ships, troop transports, base and camp hospitals and some spent time in Prisoner of War camps. The first six Australian World War 2 nurses were captured at Rabaul in January 1942 add story. The Vyner Brooke Goes Down! Shortly before Singapore fell to the Japanese in February 1942, 65 Australian World War 2 nurses were evacuated on the ship the Vyner Brooke. Twelve of the nurses died when the ship was sunk off the coast of Sumatra. The remaining 53 survivors spent a harrowing 60 hours at sea before washing a shore on Banka Island. A group of 22 of these nurses were then captured by the Japanese soldiers and killed. One nurse, Vivian Bullwinkel was the sole survivor of the massacre, read her story. Those who had escaped capture were eventually taken prisoner of war, including Vivian Bullwinkel. This group of 53 survivors were then to endure over 3 years of starvation, cruelty, disease and torment as prisoners of war, only 24 make the return trip home to Australia. At the end of the war a journalist named Hayden Lennard tracked them down and assisted with their safe passage home to Australia. Betty Jeffreys was another Australian World War 2 nurse to survive this horrendous experience Read her story! The Sinking of the Centaur! In 1943 the sinking of the Centaur quickly became a symbol of Australian determination to win the war. 'Remember the Centaur' - this ship symbolises the courage of Australian women in war and reminds us of all Australians who served in war and have no graves but the sea! -was posted far and wide. In 1943 the oceans and seas off Australia were a battle zone. On 12 May 1943 the Australian hospital ship Centaur left Sydney bound for Port Moresby to retrieve casualties from the Buna and Gona battles. On board the ship were 75 crew of the Merchant Navy, 64 medical staff, including 12 nurses of the Australian Army Nursing Service, and 149 men of the 2/12th Field Ambulance with 44 attached personnel heading for a tour in Papua New Guinea. At 4.10 am on Friday 14 May the Centaur was off the coast of Queensland and was sunk by a Japanese submarine. Of the 332 persons on board only 64 survived. 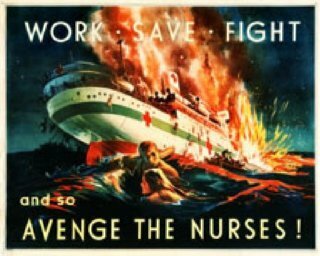 Sister Ellen Savage, an Australian Nurse, was asleep in her bunk when the Centaur sunk and was the only nurse aboard to survive. Read her story. Sister Ellen Savage and other survivors had clung to parts of the Centaur which were floating in the sea. The survivors spent the daylight hours of Friday 14 May huddled together in the sea, with sharks circling them and occasionally nosing the rafts! On the 15th May, 32 hours after the Centaur had sunk, the USS Mugford an American destroyer, picked up survivors from the Centaur 40 miles east of the Queensland Coast. At Caloundra in Queensland a memorial on a cliff points out towards the Centaur's final resting place. Another memorial was unveiled at Point Danger, Coolangatta, Queensland, in 1993 to mark the fiftieth anniversary of the sinking.